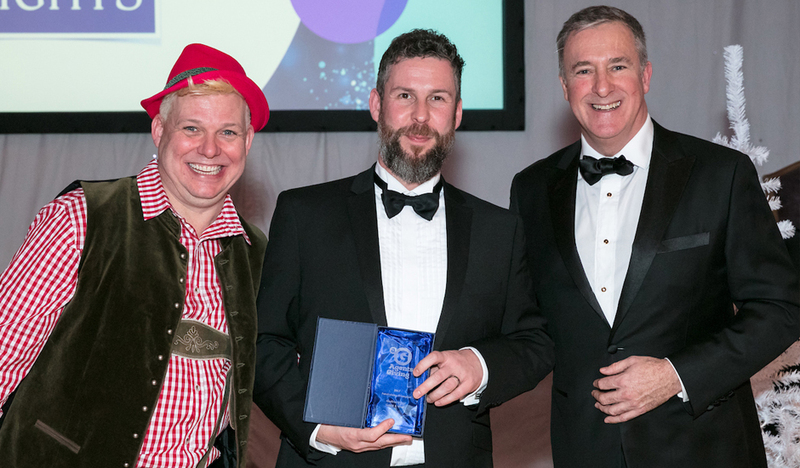 A father from Redhill and branch partner at estate agent Cubitt & West whose family is supported by Rainbow Trust Children’s Charity, has won a Fundraising Champion Award for raising funds for the charity supporting families caring for a seriously ill child. Godfrey Haire was presented with the accolade by Agents Giving, the property industry’s charity, at their annual Ball at the Royal Lancaster London Hotel on 8 December. Godfrey, who is preparing to donate a kidney to his seven-year-old son who was born with severe bladder and kidney damage, has been actively fundraising for Rainbow Trust for three years. He was introduced to the charity through Cubitt & West around 11 years ago who funds a Rainbow Trust Family Support Worker in Surrey and who have been supporting Rainbow Trust for over 10 years. Godfrey has undertaken various challenges for Rainbow Trust including the Seven Colours of the Rainbow, which saw him set himself a different task each month including taking part in Ride London with a group of friends, a 100-mile race around London and Surrey. Godfrey’s son Henry was born with severe bladder and kidney damage and Rainbow Trust Family Support Worker Nicki has been supporting Godfrey, his wife Beccy, sons Henry and four-year-old Thomas for two years.